So if you feel like 1,2,here we go. record revolves, but the boys, they know so. Here we go with with the rhythm and you know, Beat! 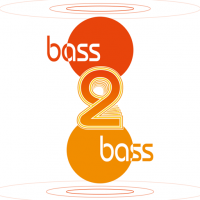 bass 2 bass is the prequel to Light Shine, which can be found in beatmania IIDX 17 SIRIUS. A portion of bass 2 bass sounds similar to the beginning of Barbie Girl by Aqua. An extended version of bass 2 bass appears on Ryu☆'s first album, starmine. A remix of bass 2 bass by Remo-con, titled bass 2 bass -Remo-con Tech Dance Remix-, also appears on starmine. A speed remix of bass 2 bass by dj MAX STEROID, titled bass 2 bass (dj MAX STEROID Remix), appears on the cyber beatnation 2 -Hi Speed conclusion- CD. Another remix of bass 2 bass by Tracy vs. Astronomical, titled bass 2 bass (Tracy vs. Astronomical Remix), appears in SOUND VOLTEX IV HEAVENLY HAVEN. bass 2 bass was one of the Class A unlocks in jubeat. In jubeat ripples and its APPEND version, it is one of the White A Class unlocks. In jubeat knit and its APPEND version, it is one of the Indigo Shirt unlocks. In jubeat prop, it was part of the Step unlocking system, unlockable by reaching Step Level 77.
bass 2 bass marks Ryu☆'s first appearance in the jubeat series. bass 2 bass's jubeat EXTREME chart has a notecount of 573, the KONAMI number. bass 2 bass is one of four jubeat crossovers for beatmania IIDX 17 SIRIUS as part of the jubeat×beatmania IIDX APPEND STYLE event. bass 2 bass is made playable by playing jubeat ripples on March 8th, 2010 onwards and having a save file on the player's e-AMUSEMENT PASS. On bass 2 bass' Single and Double ANOTHER charts, all of the vocal samples are mapped to scratches. bass 2 bass is unlockable in REFLEC BEAT as of March 8th, 2011 by playing さよならトリップ, as part of the jubeat knit APPEND FESTIVAL event. bass 2 bass is used as background music in a mission on the KONAMI arcade game ROAD FIGHTERS (ロードファイターズ). bass 2 bass received a BEGINNER chart in beatmania IIDX 19 Lincle. bass 2 bass was removed from jubeat saucer on February 1st, 2013. However, it was later revived on April 8th, 2013. It was removed again on November 1st, 2013. It was revived again on February 1st, 2014.
bass 2 bass was added to DanceDanceRevolution (2014) on December 24th, 2015 as part of the OSB～Winter★Special★Present～ (OSB～ウィンター★スペシャル★プレゼント～) event. bass 2 bass was available in beatmania IIDX INFINITAS' championship Mode from March 9th to 21st, 2016. On March 22nd, 2016, it was added to standard Mode for anyone who had played the STARLiGHT CUP in championship Mode at least once. From DanceDanceRevolution A onwards, bass 2 bass appears in the DanceDanceRevolution A folder instead of the (2014) folder. After being removed from the initial release of REFLEC BEAT 悠久のリフレシア, bass 2 bass was revived on July 14th, 2017.
bass 2 bass could be unlocked in DANCERUSH STARDOM from August 10th to 30th, 2018, by obtaining 9 play stamps. It can be unlocked again from February 11th to March 3rd, 2019.
bass 2 bass's difficulty changes from DanceDanceRevolution A20 were applied to DanceDanceRevolution A in March 27th, 2019. DANCERUSH difficulty rated from 1 to 10. This page was last edited on 31 March 2019, at 16:58.